Precisely what research findings do they have about the effects of pipe smoking on health? Please note: I say PIPE smoking. I don't want a lot of waffle about smoking in general or cigarette smoking. I need to know what tests/experiments/research has been done into the effects of smoking a pipe on a person's health. 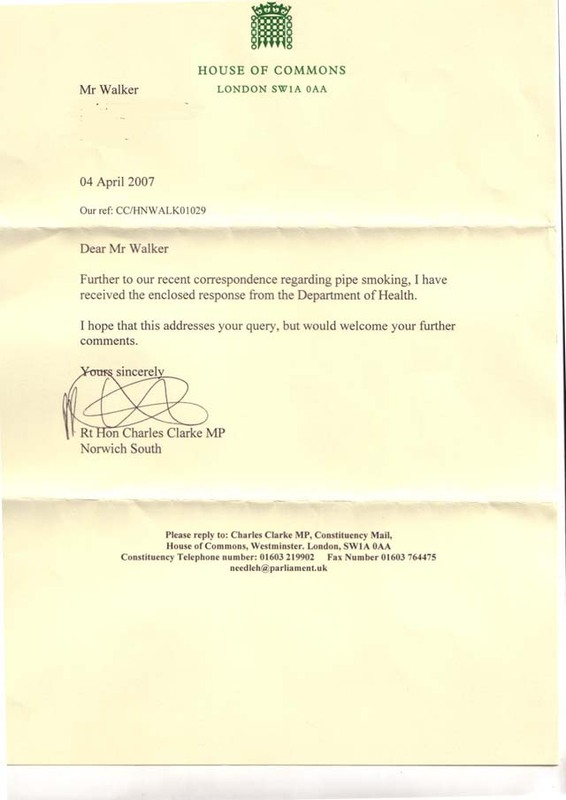 Further to our recent correspondence regarding pipe smoking, I have received the enclosed response from the Department of Health. I hope that this addresses your query, but would welcome your further comments. 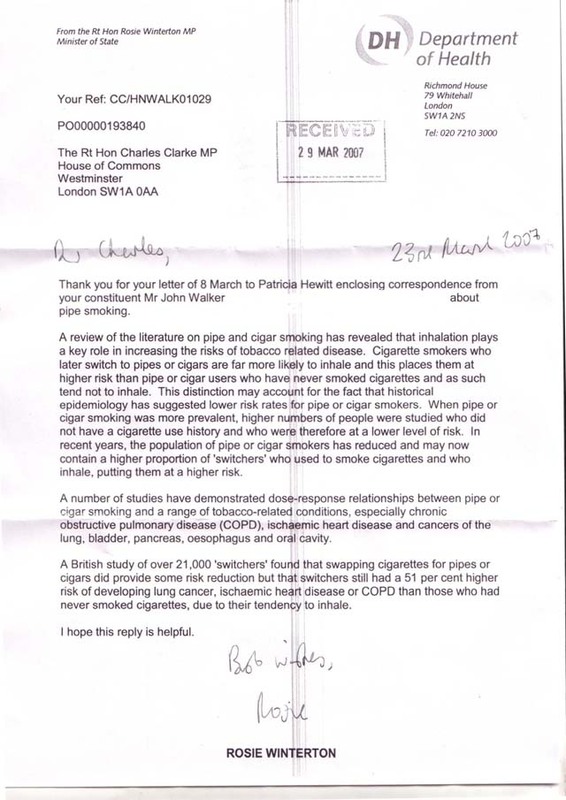 Thank you for your letter of 8 March to Patricia Hewitt enclosing correspondence from your constituent Mr John Walker about pipe smoking. A review of the literature on pipe and cigar smoking has revealed that inhalation plays a key role in increasing the risks of tobacco related disease. Cigarette smokers who later switch to pipes or cigars are far more likely to inhale and this places them at higher risk than pipe or cigar users who have never smoked cigarettes and as such tend not to inhale. This distinction may account for the fact that historical epidemiology has suggested lower risk rates for pipe or cigar smokers. When pipe or cigar smoking was more prevalent, higher numbers of people were studied who did not have a cigarette use history and who were therefore at a lower level of risk. In recent years, the population of pipe or cigar smokers has reduced and may now contain a higher proportion of 'switchers' who used to smoke cigarettes and who inhale, putting them at a higher risk. A number of studies have demonstrated dose-response relationships between pipe or cigar smoking and a range of tobacco-related conditions, especially chronic obstructive pulmonary disease (COPD), ischaemic heart disease and cancers of the lung, bladder, pancreas, oesophagus and oral cavity. A British study of over 21,000 'switchers' found that swapping cigarettes for pipes or cigars did provide some risk reduction but that switchers still had a 51 per cent higher risk of developing lung cancer, ischaemic heart disease or COPD than those who had never smoked cigarettes, due to their tendency to inhale.